When your crying puppy drives you crazy with whimpers, yelps, barks, and howls, how can you understand all those puppy sounds? Canine communication helps reinforce your puppy’s social position within his family. Puppy talk may invite you to come closer or warn to keep away. It can be confusing because puppies use barks and growls during play as well as when they mean business. Most often, vocalizations punctuate what the body movements are saying in the same way people use inflection to impart emotion and meaning. And because dogs realize people rely on verbal communication, our pets have become much more vocal than their ancestors. Barking is rare in wolves, but it's the most common vocal signal in dogs. It's used during play, defense, and as a greeting. Barks are categorized as a dominance signal. But that does not mean barking necessarily equals aggression. Barking is a canine fire alarm, a call to action that alerts the family group to the unusual. This may be anything from the arrival of friend or foe, to an unexpected sound like thunder, or the strange sight of you wearing a hat. Some dogs bark to relieve boredom, particularly when left alone for hours at a time, and dogs can be taught to stop barking. But dogs won't stop barking any more than people would cease talking to express themselves. Dogs also bark together as a joyful expression of happiness; that's why yelling at a dog to stop barking rarely works—he thinks you're joining in a communal bark-fest, and barks even louder. 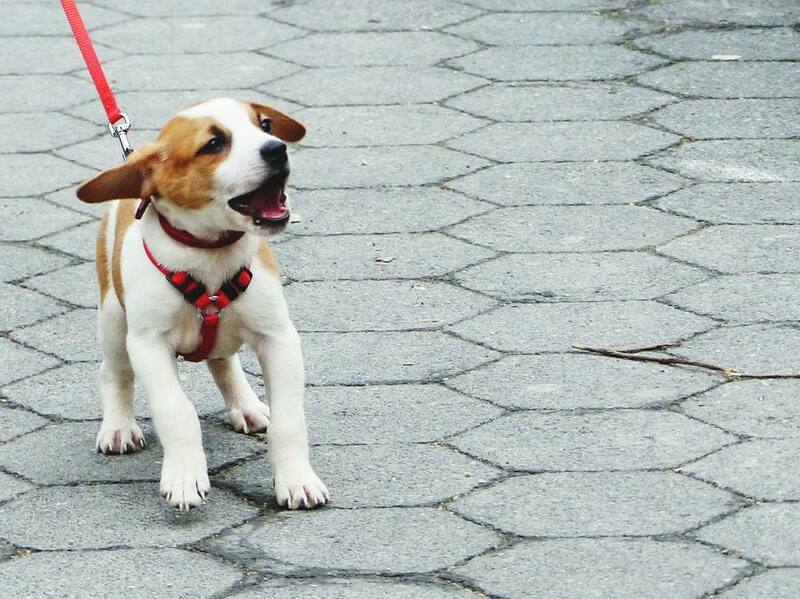 You won’t stop puppy barking altogether, but you could follow tips to reduce it. Dogs use howls to express emotion and to announce their location to missing pack members. Usually, a howl is a canine cry of loneliness that implores others to come join him. Puppies left home alone or sequestered by themselves in a room may howl. Some puppy breeds howl more than others. These include Northern type dog breeds such as Alaskan Malamutes and Siberian Huskies that may be closer to ​wolf forebears than others. Hound breeds also tend to howl more often since they were bred to “bay” as a way to announce their tracking or hunting progress in the field. Howls seem to be contagious, with a single lone call often answered by any other dog within hearing. Dogs may interpret a siren as a howl, and respond with an enthusiastic reply. My German shepherd, Magic, howls along whenever I sing—maybe he’s a critic, or perhaps he simply wants to join in the happy chorus. Whines, whimpers, and yelps communicate submission, pain or fear. The actual meaning depends on what the rest of the body “says.” When your puppy vocalizes with whines, whimpers or yelps while trying to keep her distance from you or some other situation, the sounds indicate fear. Puppy injury often gets announced with repeated yelps, and holding up or favoring the hurt paw. But whines, whimpers, and yelps also are used as solicitations to a dominant individual (usually the owner). In other words, your baby uses these techniques to beg for attention, food, or to go in or out. Growls and snarls are warnings. Dogs use these as distance-increasing signals to tell others to back off and stay away. Snarls display the teeth and aren't always accompanied by sound; they signify slight fear. Growls indicate deeper concern and can be made with the mouth open or closed. A dog's growl is used in defense and as a threat. They often are used during play when your puppy attacks a toy or wrestles with other pups. While a threatening growl and snarl can be scary, these sounds can be very important communication tools for your pup and to you. Puppies taught to never growl are more likely to bite without warning. That makes it especially important for all pups to learn proper bite inhibition. It’s important for your puppy to snarl and growl in appropriate circumstances—during play, when frightened or in pain—so you have fair warning and can adjust your own behavior accordingly. Yes, dogs laugh! It doesn't sound exactly how you'd expect, either. And while puppies and dogs use the other whines, growls, and barks in other contexts, the dog laugh appears to happen only during play. A dog laugh sounds similar to a human saying, "Ha-ha-ha-ha!" but without sounding the "a" vowel. It's simply a breathy exhalation, according to researcher P.R. Simonet. There's also research that points to a dog sneeze in certain circumstances to being similar to a "canine giggle" of delight. Recordings of the panting-laugh sound played at shelters has helped calm dogs' stress. Sneezing can prompt a reciprocal sneeze in your puppy, too--because after all, laughter is catching and good medicine. Try it! Puppies aren’t always sure how they feel. They can mix up vocal signals and make it difficult for owners to understand what they mean. Puppies that aren't sure how they feel may bark, whimper, snarl, and yelp all at the same time. That usually means they're more scared than aggressive. By learning to understand what your puppy says, you can help prevent dog bites and ensure you maintain a great relationship.